Mansfield Town could announce the name of their new manager as early as tomorrow, but first team coach Micky Moore said it was important, amid the speculation, to stay focused on Saturday’s FA Cup second round tie at Cambridge United. It has been a bit of a sideshow at One Call Stadium over the past week as off-the-field happenings have overshadowed what’s been happening on the field with caretaker boss Adam Murray still the favourite to get the job. But Moore said: “With the events off the pitch it’s easy to forget this is a football club and we have a big FA Cup tie on Saturday. But we have been keeping an eye on that and the players have as well. “The manager situation is an uncontrollable so we must concentrate on the football and prepare right for Cambridge, which will be a very difficult game. “I have no influence on it (the managerial appointment). All we can do is concentrate on the job in hand. 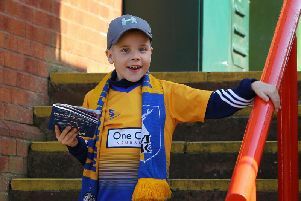 I am employed by Mansfield Town Football Club to do a job. We are all in the same boat. Until we are told any different, we will be working and preparing for Cambridge. What will be, will be, though I’ve heard it may be announced before Saturday. It’s hardly a trip into the unknown at Cambridge with the sides being in the same division and having already fought out a 0-0 draw at One Call Stadium less than two months ago. Moore said: “Cambridge will know a lot about us and we know a lot about them. They have just come up from the Conference and have continued that momentum like we did last season. It is a very difficult tie and they are a good side. “They had a good away win at AFC Wimbledon on Saturday which is never an easy place to go. So they are in good form. But, in the last three games we’ve played, we’ve been in good form as well. “Last week was manic so it’s been nice to have a blank week this week to help with our preparation. We did a double session on Tuesday and have a long one today too. Stags will definitely be without loanees Junior Brown and Vadaine Oliver but are asking Forest and Derby if they might allow fellow loanees Dimitar Evtomov and Keiron Freeman to become cup-tied on Saturday. Brown, Ollie Palmer, Rakish Bingham and Matt Rhead, with a penalty, all found the net in a thrilling 4-4 reserves draw with Rotherham on Tuesday, the latter trio all pushing to replace Oliver on Saturday.